Mount Etna, one of the world's most active volcanoes, sparked fears of a fiery eruption on Thursday after a rapid succession of powerful tremors rocked the fiery mountain. Residents of the ancient city of Catania on the eastern shores of Sicily were struck with panic after several shocks reverberated through Etna in just five minutes of each other. 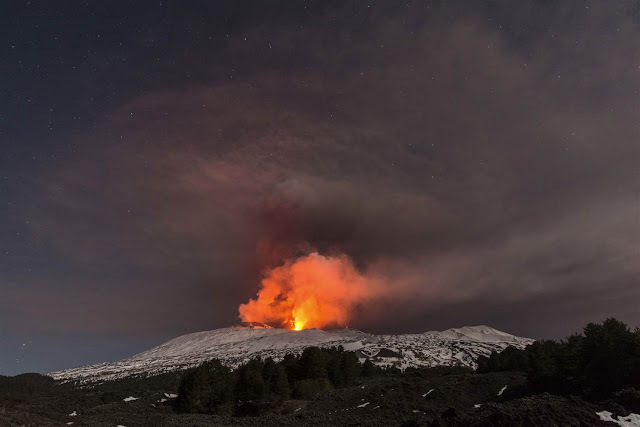 The terrifying Etna which only sits 18miles from the coastal town was rocked by three shallow tremors on its southern slopes. The National Institute of Geophysics and Volcanology (INGV) of Catania recorded the shocks in the early morning hours. The strongest of the quakes, of magnitude 3.3, struck at 9.50am local time just over 4 miles north of Ragalna, a small commune southeast of Palermo. Just a minute prior to it, in the same area, a magnitude 2.8 tremor was detected. Thereafter a third magnitude 2.5 tremor was felt. The three quakes were relatively shallow, striking at depths between zero and two km deep. Thankfully no local residents or buildings were damaged in the quakes.